An exquisite grade II listed period family home in a breath-taking location, fronting Durdham Downs. Dating back to 1860, this enviable and historic grade II listed family home offers a versatile and extensive accommodation including 5 double bedrooms (3 en suites) and 2 reception rooms PLUS a large lower ground floor with its own independent entrance offering a further 3 double rooms, or reception rooms, to suit one's requirements. The property enjoys a wide sweeping driveway with off street parking for at least 4 cars, and to the rear of the property there is a level 55ft x 35ft rear garden leading to a period coach house with independent access off Rockleaze Road, giving it great flexibility and exciting potential. 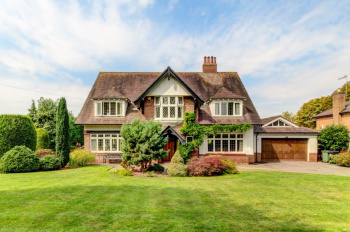 An exquisite 6 bedroom (3 with en-suite), 3 reception room Victorian detached family residence situated in a leafy and prime Redland location within just 600m of Redland Green School, whilst also offering generous balanced accommodation, (4,153 sq. ft.), a level 58ft x 56ft southerly facing rear garden, off road parking PLUS a pretty garden coach house. Wonderful room proportions throughout and an abundance of period features add to this property's overwhelming sense of space and grandeur. 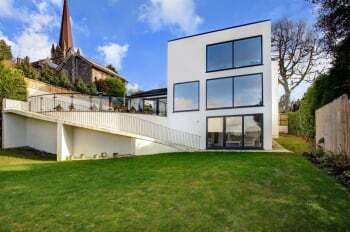 An individual contemporary styled 5 double bedroom detached home situated in one of Bristol's most sought-after roads. Recently renovated by the current owners, this striking, light and airy family home offers generous, balanced accommodation with a truly impressive 28'7 x 15'7 kitchen/diner, 21'1 x 20'11 family room with stunning views from a picture window and direct access to a southerly facing terrace. 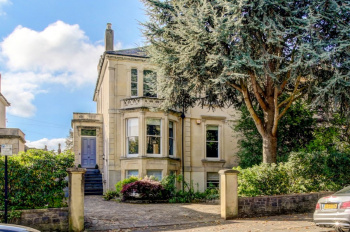 Situated directly behind double gates on one of Bristol's premier tree-lined roads in Sneyd Park, a leafy peaceful area yet within easy reach of central areas of Bristol and the green open spaces of Durdham Downs and Sneyd Park Nature Reserve. 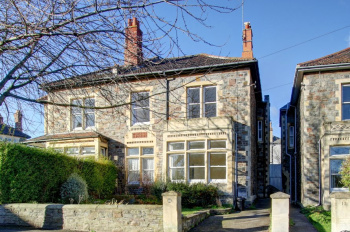 A happy peaceful home built by Stride in the 1930's, a renowned Bristol building company, and enjoying an abundance of original character and many period features. A prominent and engaging 6/7 bedroom, 3 reception late Victorian period semi-detached family house in a prime location with spacious accommodation (totalling in excess of 5,200 sq. ft.), with south west facing rear garden and tandem off street parking for at least two vehicles. 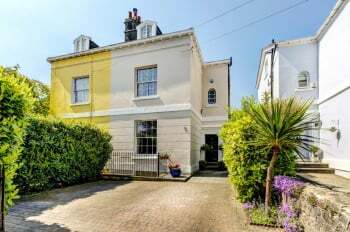 Excellent position only a few hundred metres from Whiteladies Road, convenient for the Downs and Clifton Down train station, easy access to the city centre, university and Park Street environs, main city hospitals. 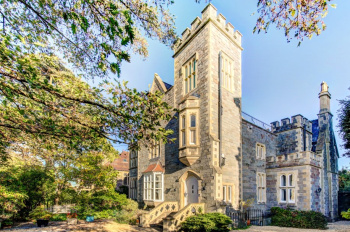 Within the AFP for Cotham School and within easy reach of an excellent selection of independent schools including Clifton College, Clifton High School, Bristol Grammar School and QEH. A truly exquisite 5 bedroom (2 with en-suite) detached family home situated in an enviable location in Abbots Leigh. Extensively renovated by the current owners over the last 5 years, this gorgeous family home enjoys ample accommodation including a breath-taking 25ft x 20ft kitchen/dining/family space leading seamlessly out onto a 75ft x 75ft landscaped rear garden. Further benefits include off street parking for multiple cars, a double garage and a newly renovated principal bedroom suite with dressing area and en-suite. 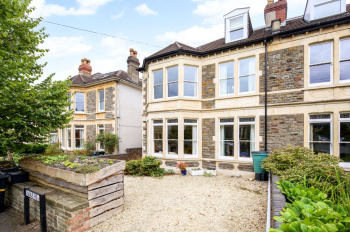 Situated in Church Road, Abbots Leigh, one of Bristol's most desirable addresses offering a semi-rural village feel, whilst being within striking distance of Clifton and central Bristol. Also offering wonderful walks nearby and convenient for access to M5/M4 motorways. 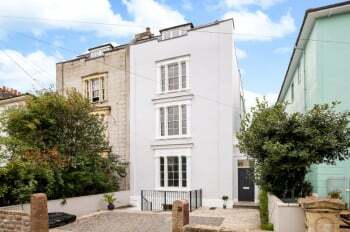 An astonishing 5 double bedroom, 3 bath/shower room, semi-detached Victorian period townhouse, circa 3,500 sq.ft., having a stunning 45ft semi open-plan kitchen/dining/living room with sliding doors, roof terrace with glass balustrade, driveway parking for 2 cars and 65ft south-westerly facing rear garden. No onward chain. Close to so many amenities: level and easy walking distance to the Whiteladies Road, Clifton Down shopping centre and Clifton Down station with the link to Bristol Temple Meads, Cotham Hill with its abundance of shops, restaurants and coffee shops, and within easy reach of the city centre, the Downs, university, hospital areas and the BBC. Circa 0.5 miles from Cotham School, Cotham Gardens Primary and SS Peter & Paul RC School. Ground Floor: entrance hallway, boot room, reception hall, drawing room, sitting room, rear hall. An impressive & flexible large mid Victorian period semi-detached town house c 3,609 sq. 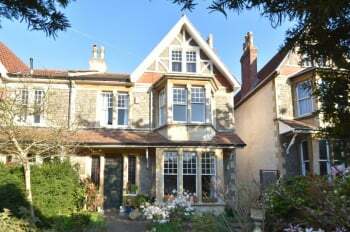 ft. with 12 main rooms over 4 floors and front & rear town gardens inc. off street parking for 2/3 cars in a prime location near Clifton College and the Downs. Currently operates as an exceptional up market 'home plus income' but the whole house can easily revert to a stunning private family residence or alternatively has potential for further flat conversion subject to planning. Currently configured with three self-contained homes in one: An extensive 3 bedroom, 2/3 reception room, 2 'bathroom' maisonette arranged over the hall and lower ground floors & two large 1 bedroom flats on the first and second floors. A generously proportioned (circa 3,250 sq. 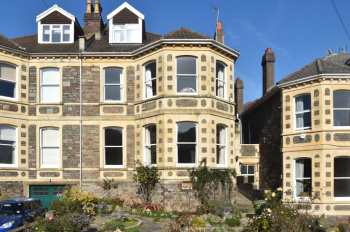 ft.), early Victorian period semi-detached town house over four floors currently arranged with 5 bedroom, 2 reception accommodation on the three upper floors and useful rooms on the lower ground floor. Enjoying a prime location near Whiteladies Road with off street parking for two cars, single garage plus both front and rear gardens. To be sold for the first time in 35 years, having been carefully maintained by the present owners and yet with exciting scope for enhancement. 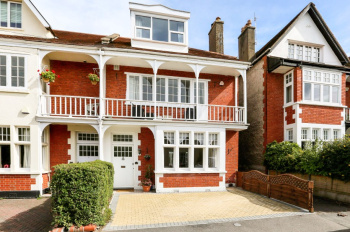 A handsome and exceptionally spacious Victorian semi-detached family house of 3,500 sq. ft. with an attractive Bath stone facade, south facing garden and ample off street parking. Large accommodation comprising 5/7 double bedrooms, 3/5 reception rooms plus a stunning kitchen/dining room (25ft x 14ft) with bi-fold doors opening onto a south facing balcony. A light, airy and elegant period feel with lots of character - ornate ceiling cornicing - high ceilings - large sash windows combine to create bright and spacious rooms. A handsome and large 5 bedroom, 2/3 reception room Victorian semi-detached property with impressive lateral accommodation arranged predominantly over 2 floors, plus additional basement games room and valuable storage, off street parking for at least 2 cars and level front and rear gardens. Prime location for families within a level walk of Durdham Downs and Redland Green Park, whilst also being situated within just 300 metres of Westbury Park Primary School and 700 metres of Redland Green Second School. Local shops and cafes of Coldharbour Road, North View and Waitrose supermarket are also within easy reach. A rare opportunity to purchase a spacious and handsome 4 double bedroom, 3 bathroom, 3 reception Victorian period semi-detached family house. To be sold for the first time in 18 years. Stylishly decorated and presented with a wealth of character. Generous 21ft kitchen/diner with access to a well-stocked and tended south-westerly garden. Off street parking for 2 cars. Stylishly decorated and presented with a wealth of character, high decorative ceilings, generous proportions, period fireplaces. A welcoming and comfortable home with real charm. A handsome and sizeable late Victorian period semi-detached family home with 5 double bedrooms (en-suite to master), 2 receptions plus a superb kitchen/dining space, driveway parking for 2 cars, very useful cellar rooms and a generous 50ft lawned rear garden. The accommodation is both beautifully presented and full of character - classically proportioned with high ceilings and large sash windows which all combine to create both a charming and very practical family home. Set in a prime location with a number of schools close by, most notably Redland Green School which is circa 300 metres away - others include Primary Schools of Cotham Gardens, Dolphin, St Peter & Paul RC, St Johns (Lower Redland Road) and secondary schools of Cotham and Bristol Grammar School & Colstons Girls (both independent). 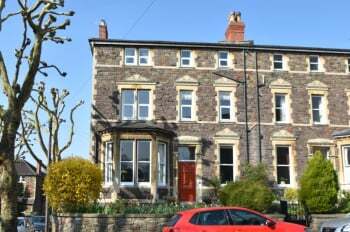 A substantial 5 double bedroom, 3 reception Victorian period semi-detached family house in a central Redland location and within 400m of Redland Green School. The property has been a treasured family home for many years and is perfectly habitable but now rather dated in condition and requires overall updating and improvement in the fullness of time. Lots of character and period detail, large principal rooms and the opportunity to extend or 'knock through' to create a large, level kitchen family space. Set in a very pleasant side road away from passing traffic and close to outstanding local schools of Colston's Primary and Redland Green Secondary. Local shops, cafes and restaurants and essential services available on Gloucester Road/Whiteladies Road/Chandos Road. A large and most impressive 5 double bedroom, 3 reception room (plus study) Edwardian semi-detached family residence situated within just 150 metres of Westbury Park School and within 600 metres of Redland Green School. Enjoying a wealth of original features and generous accommodation including a 22ft x 19ft sociable kitchen/breakfast room which leads directly onto a 55ft x 28ft rear garden, as well as having the rare advantage of a good sized single garage providing off street parking. An immaculately presented modern detached 5 bedroom (2 with en suite), 3 reception room family residence situated in a desirable cul-de-sac just yards from Durdham Downs. Further benefiting from a level 60ft x 40ft rear garden, ample off road parking and a double garage. Enjoyed and cared for by the current owners since first constructed in 1986. Fabulous location just off Durdham Downs in a peaceful cul-de-sac setting close to the botanic gardens and within a pleasant stroll over the Downs to Blackboy Hill and Whiteladies Road. Ground Floor: vestibule, central entrance hallway, large (22ft x 13ft) sitting room, modern fitted kitchen/breakfast room, dining room/reception 2, reception 3/home office, utility and cloakroom/wc. An elegant, well-proportioned and spacious, 5 double bedroom, 3 reception room bay fronted Edwardian period family house, of circa 2,500 sq. 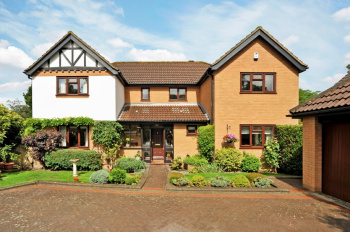 ft., situated on a much coveted tree-lined road within 600 metres of Redland Green School. Having a fabulous semi open-plan kitchen/dining room, driveway parking and well stocked south facing 45ft rear garden. 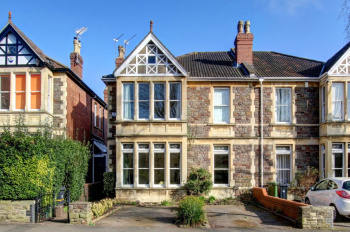 Much coveted location - a popular road in a friendly neighbourhood in the heart of Bishopston with the fantastic independent shops, cafes and restaurants of Gloucester Road within a quarter of a mile. 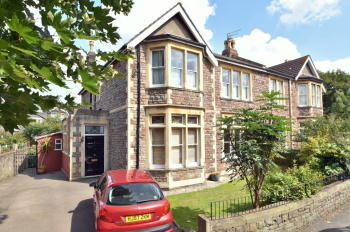 Handy for the Downs, St Andrews Park nearby and within easy access to the city centre, Clifton Village, Whiteladies Road, Bristol University, numerous private schools, main hospitals, BBC plus other local parks at Redland Green and Cotham Gardens. Redland and Montpelier local train stations are nearby. A most attractive, 5 double bedroom, 3 bath/shower room, Edwardian period end of terraced family house, of circa 2,500 sq. ft., with an extended semi open-plan kitchen/dining room, level rear garden and driveway parking. In a prime location just a short stroll of the Downs, excellent schools, shops and facilities in nearby North View and Henleaze Road. A fine period residence (circa 1908) of character both internally and externally, retaining most of its original features - covered balcony, casement windows, fireplaces and simple moulded cornicing. An impressive and most attractive 5 double bedroom period family residence offering ample accommodation and a lovely south westerly facing rear garden. 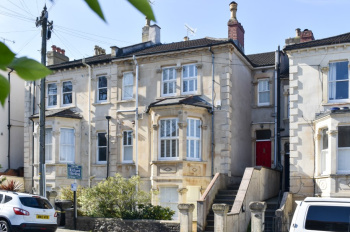 Fabulous location within a level stroll of Cotham Gardens Park, Redland train station and the highly regarded restaurants of Cotham Hill. Also nearby Whiteladies Road with further shops, amenities and bus connections. 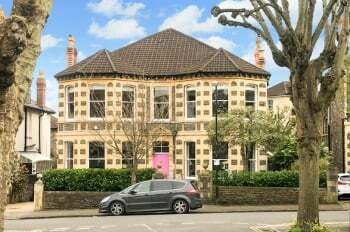 Within just a few hundred metres of excellent schools; Colston's Primary, St Peter & Paul Primary School and Cotham Secondary School. Ground Floor: welcoming reception hallway, beautiful bay fronted sitting room with log burning stove, impressive 24ft x 13ft kitchen/dining room and separate utility room/wc. First Floor: landing, principal bedroom with dressing area and en suite shower room/wc, 2 further double bedrooms and a family bathroom/shower/wc. A handsome and substantial (circa 2,500 sq.ft. ), 5 bedroom, 3/4 reception room Victorian period semi-detached family house with front and rear gardens. The house offers a blank canvas - more than habitable but with the exciting chance to update, improve and possibly extend/knock through in the fullness of time. 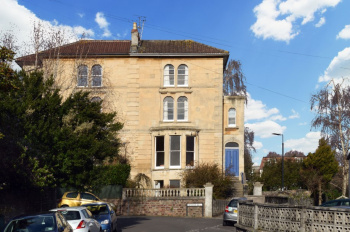 Set in a favourable location within 500 metres of Redland Green School and close to the popular Gloucester Road with a large range of independent retailers and essential services. 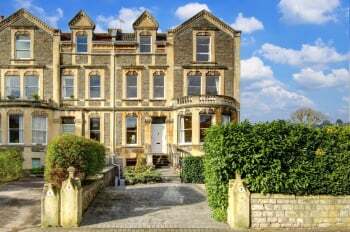 500 metres to the lovely Cotham Gardens and also Redland train station providing a link to Clifton and Temple Meads. Ground Floor: vestibule, entrance hallway, drawing room, dining room, study/play room, kitchen/breakfast room and bathroom/wc. First Floor: landing, 5 bedrooms, bathroom/wc and separate wc.